Unframed oil on canvas Lake Landscape depicting Italian Lake Maggiore view of the Isola dei Pescatori, Fishermen Island, Lago Maggiore, Italy signed lower right E. Gignous, apocrypha signature. 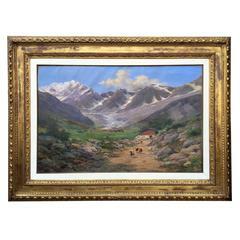 The painting composition is realized in the style of the Italian Milanese painter Eugenio Gignous, (1850-1906), one of the greatest Lombard landscape painters of the 19th century. There is a traditional indeterminate foreground, livened up only by the fishing boat on the shore, opposed to the scenic expressivity of the background landscape, the water mirror centered by the Isola dei Pescatori and the town of Baveno on the left of the canvas and the mountains behind. In good condition this North Italian lake view with mountains in the distance and Baveno on the left of the composition, dates back to late 19th century, it is lined with new stretcher and shows minor painting retouches in sky on the upper left. It comes from a Lombard private collection near Milan. Measures: Height 70 cm Width 130.5 cm. OUR OWN INSURED SHIPPING QUOTE INCLUDES A SAFE PACKING AND CRATING IN A CUSTOM-MADE FUMIGATED WOODEN BOX. 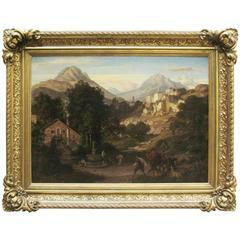 19th century pair of Italian paintings 1800 landscape.